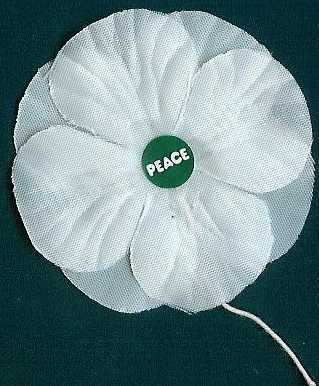 We started wearing handmade white poppies many years ago. For us, wearing both red and white poppies is a way of saying “Remember the fallen, including civilians, and work for peace”. We have had many meaningful conversations with strangers that started with “What’s the white poppy for?”. In Britain, the idea of decoupling Armistice Day, the red poppy and later Remembrance Day from their military culture dates back to 1926, just a few years after the British Legion was persuaded to try using the red poppy as a fundraising tool in Britain. A member of the No More War Movement suggested that the British Legion should be asked to imprint ‘No More War’ in the centre of the red poppies instead of ‘Haig Fund’ and failing this, pacifists should make their own flowers. A few years later the idea was again discussed by the Co-operative Women’s Guild who in 1933 produced the first white poppies to be worn on Armistice Day (later called Remembrance Day). The Guild stressed that the white poppy was not intended as an insult to those who died in the First World War – a war in which many of the women lost husbands, brothers, sons and lovers. The following year the newly founded Peace Pledge Union joined the CWG in the distribution of the poppies and later took over their annual promotion. I have always had respect and sympathy for veterans, who put their life, health and family on the line to serve. I believe they deserve recognition and support, but for years I was uncomfortable wearing a red poppy, because of the undercurrent of promotion and recruitment for current and future wars that I detect in many public events around the topic of supporting veterans. The white poppy attracts questions, and gives me a chance to explain the nuances of my support. For more thoughts on remembering all victims of war, please see our Community Voices page. There is a peace education kit with Canadian materials available on www.consciencecanada.ca (see “Remembrance Day Education kit” under the Resources tab). In addition, the Peace Pledge Union in Britain has great educational material, for example A Tale of Two Poppies. Where does your money go? We distribute poppies by donation as a consciousness raiser, not a fundraiser – we just try to break even (not counting our hours, gas, …) . Importing poppies costs us ~$.98 ea. This money goes to the Peace Pledge Union in Britain and helps fund their excellent peace education work. Our additional expenses for pins, postage, envelopes & printing are ~$.27/poppy for a total of ~$1.25/poppy. Your donation of $1-$2/poppy lets us cover expenses and provide poppies at below cost to schools and disadvantaged groups. The P.P.U. poppies have a wire instead of a pin. 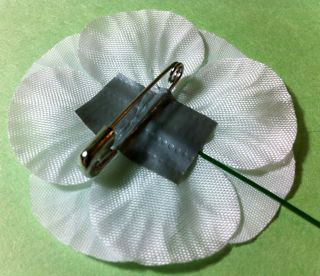 For the older poppies without felt (we are still shipping some of those for packs of 10), we recommend attaching a 1-inch safety pin to the cloth using a 1″ piece of duct tape 3/4″ wide. 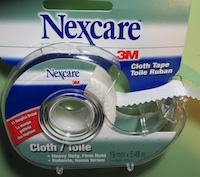 3m Nexcare cloth tape 19mm (3/4″) or 25mm (1″) is better. Unfortunately neither tape sticks well to the felt poppies, especially when it gets wet. Our packages include a sample poppy with safety pin attached. 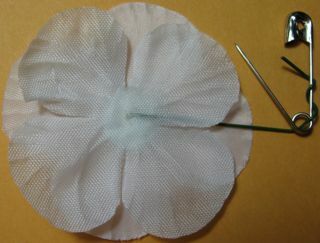 • Pinch the poppy firmly in the middle while you fold the stem in half, back up towards the centre. • cut a tape strip about 1cm wide x 2cm long. 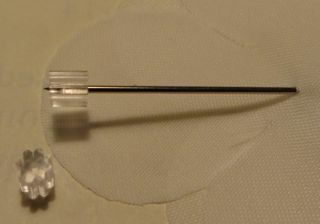 • open safety pin and centre tape over the back of the pin. • press and smooth tape firmly to pin and poppy. Some of the P.P.U. 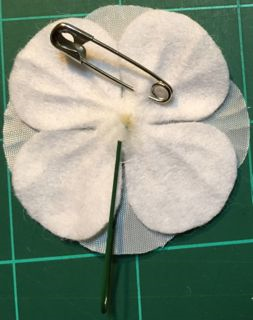 poppies have a felt back, which does not stick to the tape as well as the old fabric, but the felt is strong enough to put a 1 inch safety pin through. Alternately you could twist the wire around a safety pin (around 1 inch) . The wire for the 2017 batch is easier to bend, but a bit too long for this. First cut the wire so it only sticks out 1.5 inches past the edge of the flower, then slip the wire into the loop of the pin, and twist the wire around the pin To avoid the wire coming unglued from the heart of the poppy, pinch the centre securely between your fingers when bending the wire to position the pin back to the centre. Push the pin through the velcro on a jacket rather than the thinner nylon fabric. Be careful to not puncture the waterproof part of a jacket. Unfortunately we are not accepting orders from November 2 until November 19, except for depots and local bulk pick up. We are running low in supplies, timely delivery is unlikely, and we need to concentrate our efforts on the November 11 Ceremony. 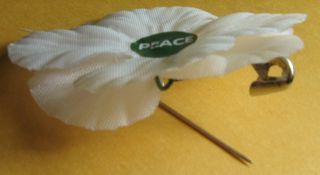 Click here to download White Peace Poppies Order Form. 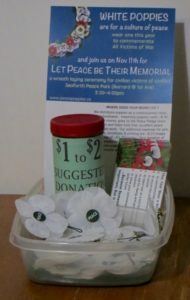 Peace is good all year, and many people still want to wear white poppies outside Remembrance Day. We continue to do mail-order. You can also ask us to send you a reminder next year. We distribute poppies by donation as a consciousness raiser, not a fundraiser – we just try to break even (not counting our hours, gas, …) . Importing poppies costs us ~$.98 ea. This money goes to the Peace Pledge Union in Britain and helps fund their excellent peace education work. Our additional expenses for pins, postage, envelopes & printing are ~$.27/poppy for a total of ~$1.25/poppy. Your donation of $1-$2/poppy lets us cover expenses and provide poppies at below cost to schools and disadvantaged groups. Please see their website. In Fall 2009, shipping by air from London to Vancouver took about 5 business days. In 2010 air mail took 2 weeks, but “airsure” took 4 days. Shipments to us by surface mail took 7 to 8 weeks. We used to make our own by drawing the outline of a flower on a piece of card and sticking it to a used button. If you have a printer that can print photos on 4×6 inch glossy paper (or a 4×6 card), click here to download a picture of 3 white poppies (pdf). Hand-drawn poppies may be better, especially if the ink from your printer is not waterproof. 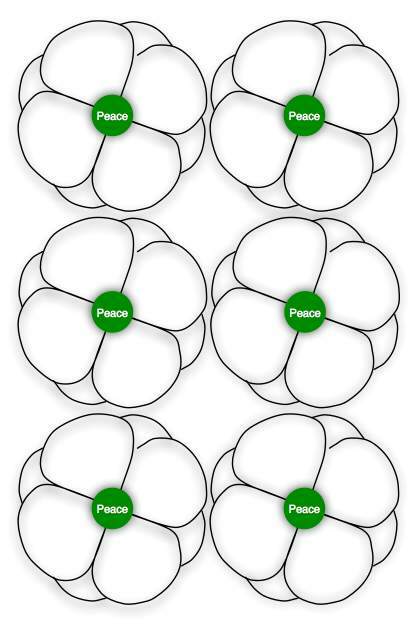 More economically, download and print the image of 6 flowers at home or at a photo shop. These are a bit smaller, closer to the red poppy size. 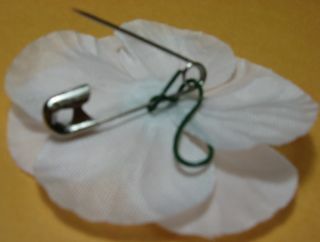 Cut a piece of cloth adhesive tape (ex: duct tape) 1″x1/2″, fold a ridge, then stick to the back of the flower. You can then stick a pin (straight or safety) through the ridge in the tape. Or see picture of duct tape around safety pin. Many people have for years been making their own poppies out of fabric, cardboard, felt, plastic or other materials. If you have homemade poppies, we would love to get a closeup photo and/or instructions on how to make them, to put on this website.